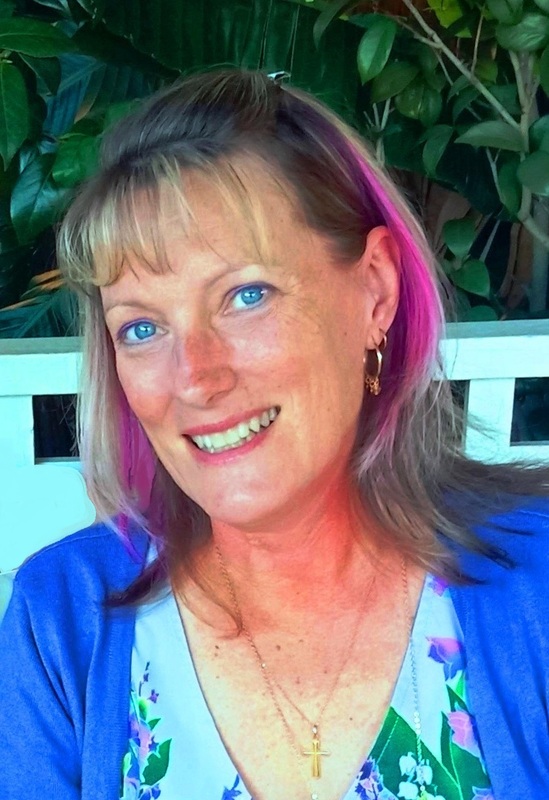 Re-thinking "reality" has been one of the biggest learning curves I've dealt with in midlife. The idea that my reality is different to actual reality was a completely new concept for me to get my head around. My reality was way too perfect and too controlled and needed to be taken down a notch or two - and that was an eye opener. I had somehow created a world where I expected to live happily ever after, never really touched by pain or hardship or less than perfect families, jobs or friends. It was way past time to do a reality check and realize that what I saw as my entitlement in this life might not be quite so tidily tied with a bow. True reality is that I need to deal with messy stuff and hurdles - it's not all Brady Bunch and sunshine and rainbows. Maybe my husband won't turn out to be superman, maybe he'll have flaws or failings but does that mean he's any less worthy of being loved? Maybe our adult children will make choices that we aren't thrilled about, but does that make them wrong choices? Or even if they are wrong, maybe that's their life journey that they need to work through without being rescued as soon as they put a foot out of place. Perfectionism is a killer - it creates unreal expectations, sets us up for disappointment, and failure, and dissatisfaction. It doesn't allow for human failings and frailties. It holds us in its grasp and slowly strangles the joy and freedom out of our lives. I needed to take Perfectionism by the scruff of the neck and toss it out of my life. I'm replacing it with the word "Enough" because that is all I need and more from life and from the people I love. In fact I think "Enough" is going to be my word for 2017! 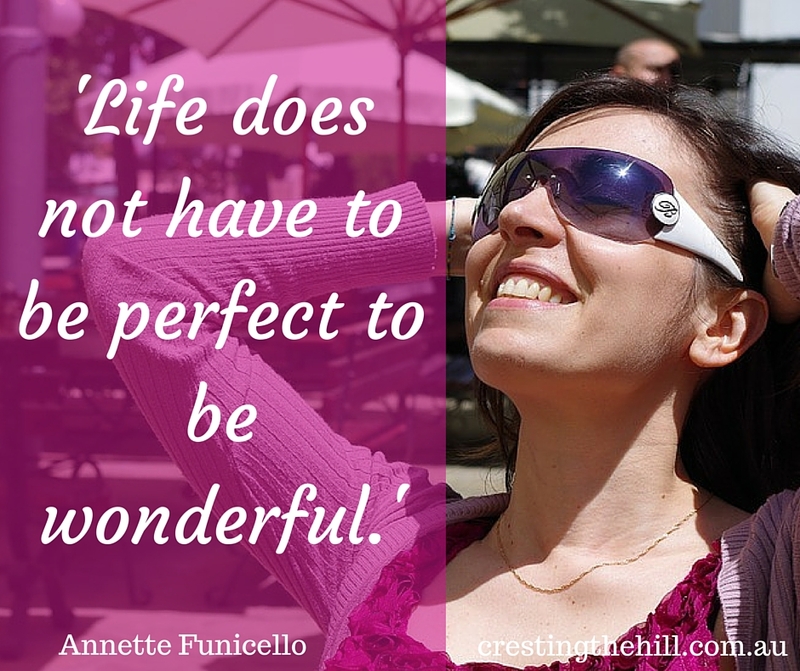 Life is "perfect" if we choose to look at it that way. Resenting the hiccups that are a part of the big picture doesn't make them go away - it just turns them into bigger bumps. I always thought I wanted a gently sloping road to travel....smooth under foot and bordered by rolling pastures - but then there would be a lot of adventures that I'd miss along the way. Riding the roller coaster and being in turn scared and exhilarated is what makes life interesting. It would make me less compassionate (an area I need to continually work on) and life would be less real and probably fairly boring. As Christmas approaches again I'm choosing to take it one day at a time. My planning is minimal and my expectations are at the lower end of the scale. I can't control how family events turn out, all I can do is love and appreciate people and let them handle their own lives. I don't want to set up hoops for them to jump through, I don't want to jump through any of those hoops myself - and if Christmas is less than "perfect", I'm sure that it will still be "enough" and it will be a gift to be gratefully received and enjoyed - I intend to be "happy and at peace with the uncertainty of life, no matter what occurs". Funny but, yesterday after a difficult family moment, my dearest friend asked "Would it help if you looked at your reality?" She was right. My imperfect reality is perfect- just as you said, in the way you said. I guess I've always been grounded in reality, mine or some uber reality. I think for me, how i frame things that happen and how I work through the bad stuff drives my quality of life. I completely agree Carol - quality of life is 100% about how you perceive your reality and your response to that perception - I'm getting there slowly but surely. I love this, Leanne! It is so true!I so much want to control everything I see about me and, it I let it, it would drive me mad. I love this quote, “[The fact is] most putts don’t drop. Most beef is tough. Most children grow up to be just people. Most successful marriages require a high degree of mutual toleration. Most jobs are more often dull than otherwise. Life is like an old-time rail journey—delays, sidetracks, smoke, dust, cinders and jolts, interspersed only occasionally by beautiful vistas and thrilling bursts of speed. The trick is to thank the Lord for letting you have the ride." I LOVE that quote Diane! It is so true - I don't know where we get these glossy expectations from, but leaving them behind and enjoying the ride (good and bad) is what makes life joyful. I've always been the type of person that has to have control over everything. As I grow older I realize just how impossibly stupid that idea is. Accepting the world and our place in it is letting go and trusting that we have the tools to deal with anything that comes our way. I'm working on it daily. Me too Rena - older and wiser springs to mind. Maybe we're getting that wisdom and if we actually apply it we could be in for some really pleasant years ahead! I feel that we can create our own reality somewhat and then life throws you an unexpected punch. It's all good though. It's all how you react to things. Oh wow Leanne I just saw that quote somewhere else - on a poster or something - and thought that I should get that for my study wall! This is an important reminder, especially during the holiday season when expectations are often unrealistic. That top quote is, well, perfect! I think Christmas brings this out in me in droves Lois so letting go a little and being open to an imperfect season will bring me a lot more joy this year! I completely agree Kathy - I think my problem was trying to create a Christmas for my little family that I thought would work - and facing resistance on a lot of fronts. Now I just roll with the flow and hope that everyone was happy and felt loved on the day. Fantastic post! Great post to end the year. Love it. Nice post! Sometimes we get caught up in our own (or someone else's) unrealistic expectations and only causes unnecessary stress and suffering. What's the point? This year has been truly difficult for me and my family, and we've all had to accept that there are times when things are going to be less than perfect. But the important things remain, and that's what we should be thankful for. I spent years trying to be perfect- the perfect home, the perfect family, the perfect job. It was exhausting. Funny how midlife has made me look at perfection with a new lens. I also have spent the least amount of time ever in trying to make a perfect Christmas this year, and somehow I think it is still going to turn out just fine! Happy holidays to you and your family. I'm the same! So much striving and so little to show for it in the end. I'm relaxing more each year and finding that I'm not missing out on anything - in fact I'm probably enjoying things a whole lot more when I let go. 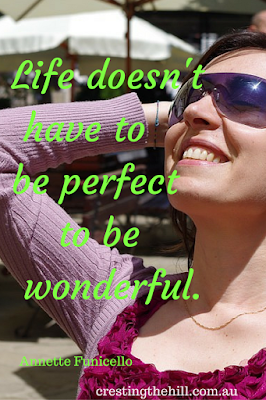 Life is "perfect" if we choose to look at it that way... #nuffsaid and I cant agree more. Thanks for sharing at the Pit stop! Such a Powerful message. Awesome! Perfect is definitely in the eye of the beholder Julie - and when we adjust our focus a little it is so liberating! No surprise:) The blogger's Pit Stop is going to feature this post on Friday. Congratulations.